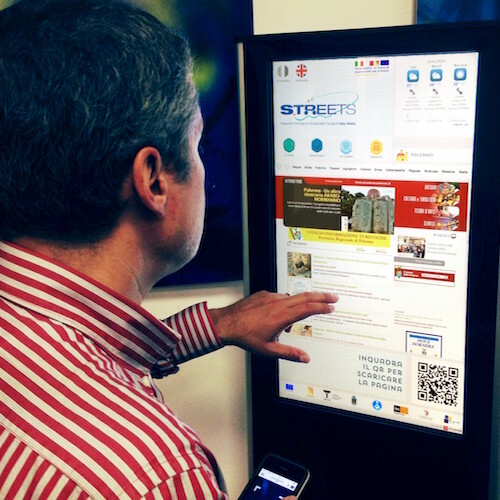 Streets is a platform developed to give information about mobility projects between Italy and Malta. We used QRouteMe® to achieve an information system accessible from five interactive totems both for indoor and outdoor use with a touch screen interface and internet access. Out totem were placed in: Vegetable Market in Vittoria (RG), Piazza Cavour of Scoglitti (RG), Virtuferries terminal departures and arrivals (La Valletta, Malta), Vincenzo Florio Airport of Trapani-Birgi, Land Side zone in Cosimo airport. The information content was organized and made available through an appropriate interface, designed according to communicative and strategic objectives project.